Auscultation is the technique of listening for sounds produced in the body. Auscultation of the chest is used to identify lung sounds. The stethoscope usually has two heads: the bell and the diaphragm. The bell is used to detect low-pitched sounds, and the diaphragm is better at detecting higher pitched sounds. The bell must be applied loosely to the skin;if it is pressed too tightly, the skin acts as a diaphragm, and the lower pitched sounds are filtered out. In contrast, the diaphragm is applied firmly to the skin. 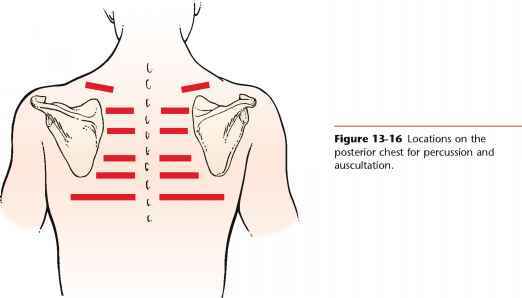 In very cachectic individuals, the bell may be more useful because the protruding ribs in these patients make placement of the diaphragm difficult. The correct placements of the heads of the stethoscope are demonstrated in Figure 13-18. It is never acceptable to listen through clothing. The bell or the diaphragm of the stethoscope must always be in contact with the skin. Figure 13-15 Percussion. A, Position of the right hand ready to percuss. B, Location of the fingers after striking. Notice that the motion is from the wrist.